This card was quick, easy and fun to make! 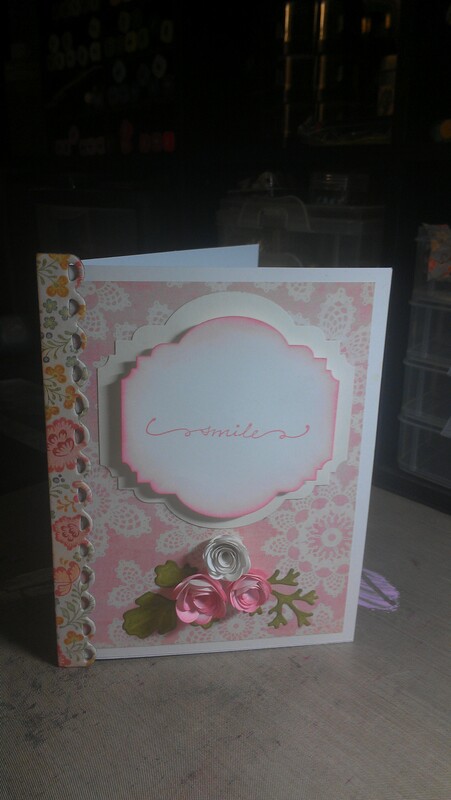 I pulled out some pieces I had previously cut on my Silhouette Cameo 2 and this card was born. The Avery Elle Stamp Set is called Handwritten Notes. I love this stamp set because it has the tiny arrows with words to add as if you were writing it and wanted to add something extra. All of the sentiments are long and horizontal but you can stack them like I did by just inking up the area you want to stamp. 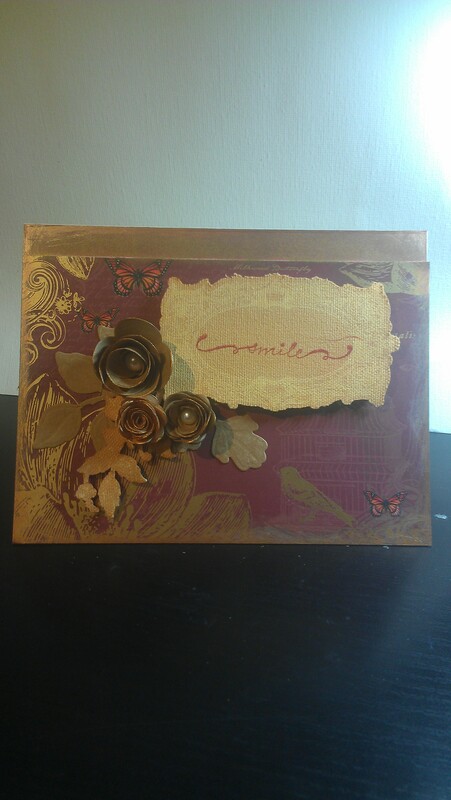 I used Versamark embossing ink and some brassy gold embossing powder to make the sentiment really pop. 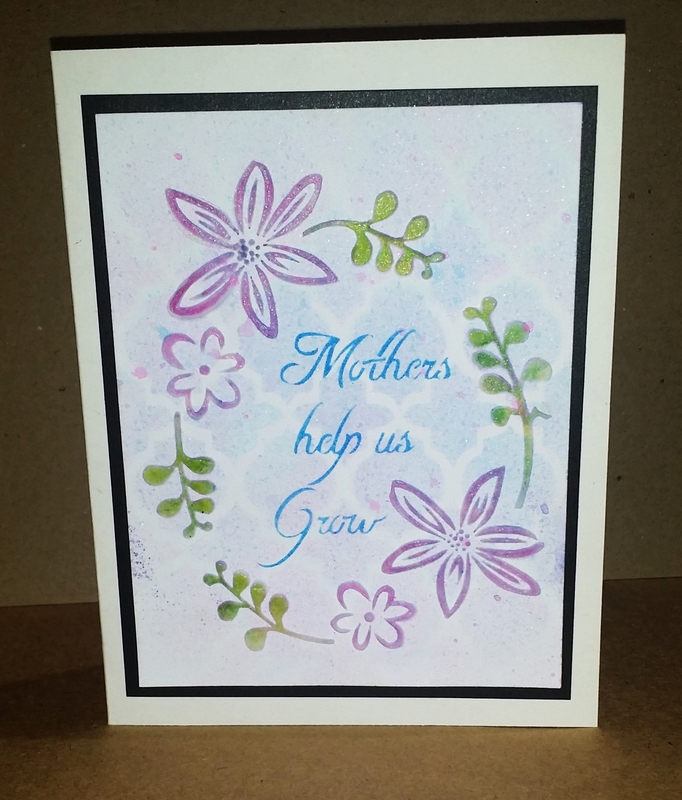 Here’s a card I made last night for my Mom. This card took me about 35 minutes which is a good time frame in my opinion. There’s times that a card can take me over an hour to complete. This one hit that sweet spot where there’s still coloring and detail but it didn’t take me an astronomical amount of time to complete. A list of supplies will be listed below the pictures. •Lawn Fawn Mom + Me Stamp Set (25% off in our store right now!) Also available at Simon Says Stamp by clicking the picture below. • Lawn Fawn Celebration Scripty Sayings (for inside sentiment) (25% off in our store!). Also available at Simon Says Stamp by clicking the picture below. • Lawn Fawn Perfectly Plaid Paper (discounted in our store as a set) . Also available as a set from Simon Says Stamp by clicking the picture below. • Zig Clean Color Real Brush Markers from Amazon or Simon Says Stamp by clicking the picture below. • Water Brush from Amazon or Simon Says Stamp by clicking the picture below. • Staedtler Ergosoft Watercolor Pencils from Amazon by clicking the picture below. •Colorbox Petal Point Pinwheel for the Purple and Blue inks used on the front and inside sentiment from Amazon by clicking the picture below. • Colorbox Cateye Ink in Brown for the Tree Trunk from Amazon by clicking the picture below. • Tim Holtz Distress Ink in Walnut Stain used on the owl stamp from Amazon or Simon Says Stamp by clicking the picture below. • Scotch ATG Gun to adhere everything firmly and securely from Amazon or Simon Says Stamp by clicking the picture below. That completes the list of necessary supplies. This card came together so nicely and I had a lot of fun making it. Don’t forget to subscribe to our Youtube channel so you can see the making of this card when the video is posted! Thank you for stopping by! As you know from my last blog post, I recently got a Silhouette Cameo 2 Electronic Die Cutting Machine. When I finally decided to purchase this machine after drooling over it for years, I told myself if I am going to dish out hundreds of dollars for another electronic die cutting machine I BETTER USE IT A LOT. Yes, I yelled it at myself in my head. I deserved the yelling though. Considering I spent $350.00 on the Sizzix Eclips when it first came out and I have a SLICE machine. I actually occasionally use the SLICE machine still just because it’s so small and convenient. Sizzix obviously realized they made a huge mistake with the Eclips machine because the cartridges that they used to sell for $40-60 each are now $5.00-6.00 on their website. I’d say that’s admitting you messed up. I didn’t purchase any cartridges and the only reason I bought the Eclips was because I knew I would also purchase the ECAL software (for $50.00 more) and make my own designs. Sizzix actually has an Eclips 2 now that’s specifically designed to be used only with a computer. I suppose I could have just kept using my Eclips but I just did not like the software at all! So, after years of contemplation, I bought the Silhouette Cameo 2 and got a great bundle with a ton of extra stuff for only $250.00 and Silhouette doesn’t charge you for software (unless you want the designer edition). Now there’s a company that knows what they’re doing! So, here’s a fair warning that a lot of my blog posts will likely include the use of the Silhouette Cameo 2 machine. However, I am sure a lot of what I am using it for could be achieved in other ways. Such as fussy cutting or using the dies that manufacturers make that you can run through a manual die cutting machine such as the Big Shot (which I still plan on using). On to the real reason we are here! I was playing around with the Silhouette Cameo 2 and thought it would be sooooo cool if I could turn some of my stamps into die cuts! It was easier than I expected and I am so happy with the results. Take a picture of the stamped images after mounting them on your PixScan Mat. Import the Pixscan image and trace it. Don’t just trace the outside edge like you normally would. Trace the entire image. Cut out the images and assemble on a card. It’s as easy as that! I also cut out the outer edge so I had something to stack the inside of the flower on. I love how well this worked and it’s an awesome way to stretch your stamps. Isn’t that just amazing!? If you have a Silhouette Cameo, I HIGHLY recommend getting a PixScan mat if you don’t already have one. It will greatly increase your creative abilities. 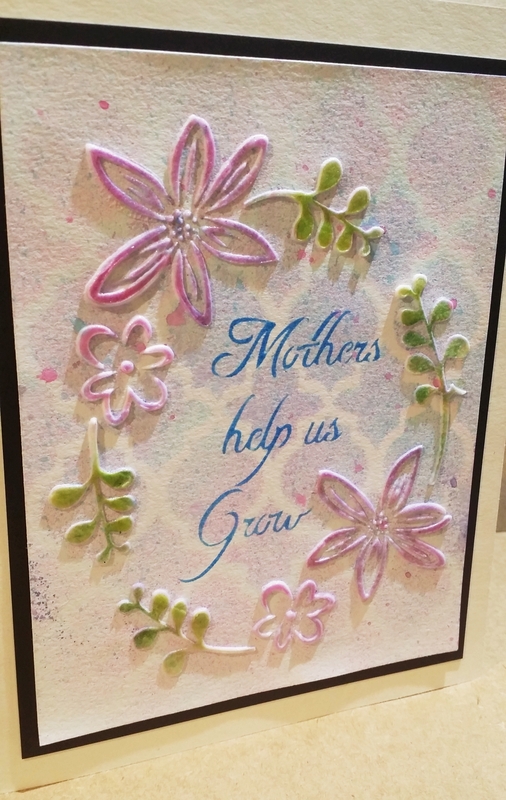 All of the papers used on this card are Authentique and the stamped sentiment is by Avery Elle. That’s it for today. Thanks for stopping by! 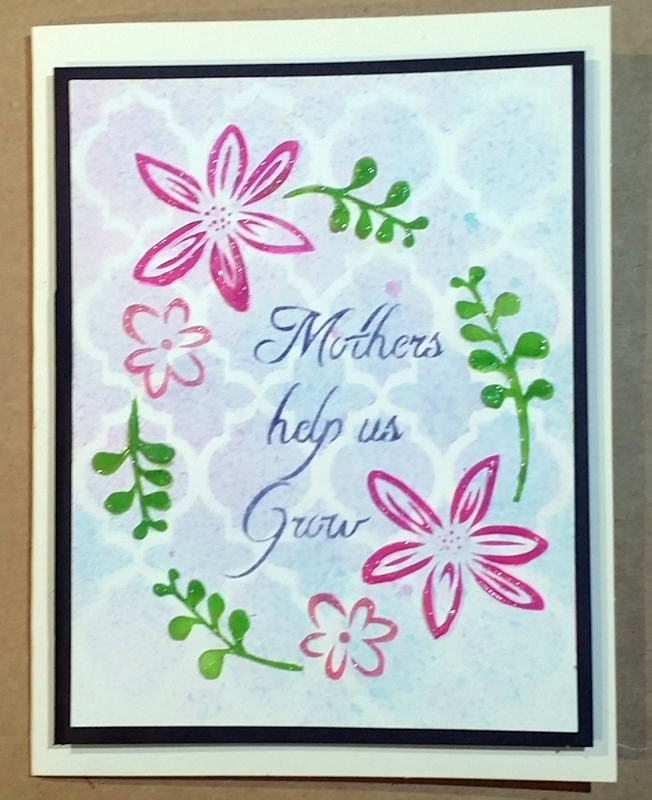 I made this Mother’s Day Card almost exactly how I did in my last post except I used a different technique and medium for the stenciling of the Floral Frame stencil. This one came out so much more vibrant because of this technique. Using Prima Light Paste and then brushing Distress Inks over it after dried. You can see that by mixing the Distress Inks directly into a clear glossy medium, you will end up with vibrant results. Brushing the distress ink over the opaque Light Paste gave it more of a pastel effect. The card on the left did take significantly longer though. I had to mix each color individually and then carefully apply it through my stencil using a palette knife and masking off areas that I didn’t want a certain color in. For the card on the right, I just applied the Light Paste through the stencil , let it dry, and then brushed the Distress inks over top after placing the stencil back on to protect the surface underneath and keep the color just on the stenciled areas. I used the same Distress Ink colors except the green. I believe I used Peeled Paint for the card on the right. 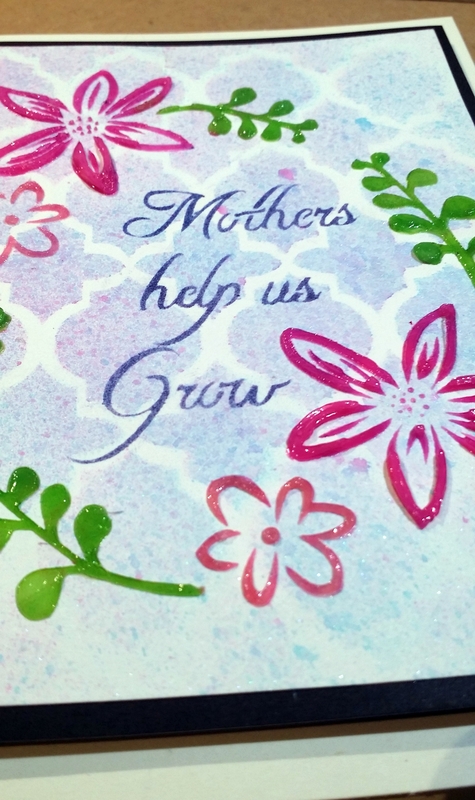 I created a Mother’s Day card using our new Stencil Set “Mothers help us Grow” . This card was very easy to make and a lot of fun! •Luster Mica Spray Mist in 3 colors. Or mix Luster Mica Powder in a spray bottle.I used Blue Ice, Shallow Waters, and Hawaiian Orchid. • Cream card base measuring 9-1/2″ x 6″ , scored to create a 4-3/4 x 6″ card. • Recommended, but not necessary, non-stick craft mat and heat tool. First lay the Moroccan Tile stencil on the watercolor paper and quickly spritz with the 3 Luster Mica Spray Mists. You need to do this quickly because the paper will start to curl. The cool thing is, you will end up with a concentration of color in the middle and it will fade out to the edges. Let that dry for a second and then grab the Floral Frame Stencil and place that on top of the watercolor paper and tape it down to your work surface. These stencils are made specifically for 4-1/2 x 5-1/2″ card bases so it makes it easy to get it perfect. Grab your palette knife and Prima Light Paste and apply light paste through the stencil. Carefully remove the stencil when you’re done applying the paste. It’s best to let this air dry, but if you are impatient, you can use your heat gun. Just be careful because it will bubble if you leave the heat in one area for too long. One that is dry to the touch, re-apply the stencil and grab your distress inks and sponge. You can easily color the flowers and leaves since you have the stencil protecting the surface underneath. Dab on color as you see fit and then remove the stencil. Let that dry for a little bit and then apply the “Mothers help us Grow” stencil. If you line this up with the paper, it will align itself perfectly inside the floral frame. Grab another distress ink and a sponge and sponge the ink through the stencil. I found that cosmetic sponges work better than the small sponge daubers for this stencil. Since it has words on it, there are a few areas that the sponge dauber would snag on, but the cosmetic sponge did not. You can carefully lift the stencil and peak if everything went through properly before deciding if it’s done. Then all you have to do is tape it on the black piece of cardstock and then the card base. It’s that easy! Check out the dimension you get when you used the Prima Light Paste with one of our stencils! Thank you for stopping by!